Exotic pets are gaining in popularity and require food supplies different from your average cat and dog food. Commercial cricket farming has become a lucrative business with limited start-up costs. But, before you decide to start a cricket farming business, you should consider several important factors, such as the noise and odors crickets make. Before you decide to get into commercial cricket farming there are some things to take into consideration, according to the website anapsid.org. There is a definite odor to crickets, mostly caused by the water dishes with cotton wool in them that can collect droppings quickly. Keeping the colony clean and well maintained will keep the odor to a minimum. Also, with few exceptions, crickets are noisy and need to be kept in an area where they will not create a disturbance. There are three basic types of crickets, according to the Byron Thurman website. Native to Europe and now North America, house crickets are the most common food for predators that eat insects. Adult house crickets are light yellow brown in color and measure approximately 1 inch long. Camel crickets are sometimes called cave crickets, are tan in color and have a hump back. Camel crickets are usually 1 to 1 1/2 inches in length and are wingless and therefore do not chirp. The field cricket is black in color and can be up to 1 1/4 inches in body size. They inhabit flower beds and lawns and in overgrown grassy areas and are strongly attracted to light similar to the house cricket. 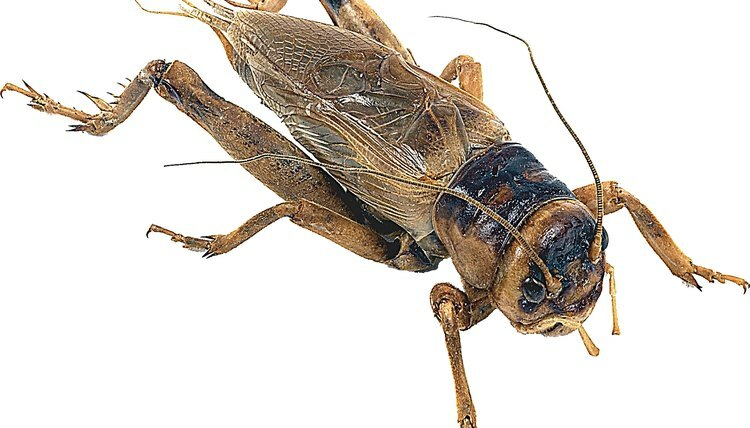 In order to set up a high yield of crickets of various sizes, a system with a removable egg-laying container allowing the separation of eggs and adults is ideal, according to the website anapsid.org. You will need various size plastic containers for breeding, nesting and food. Medium sweater boxes work well for the rearing containers. Use something easily transportable as the egg “flats.” Other items include a water dispenser such as a chick waterer available at most feed or specialty pet shops, plastic scouring pads or quilt batting, several jar lids, aluminum mosquito screening and a heating pad (optional). Use a deep plastic storage container with 4 inch by 4 inch holes, covered with mosquito netting, cut into the opposite ends. The water dispenser, a plastic jar inverted over a circular trough, is set up at one end of the breeding container. The egg “flats” are vertically inserted throughout the breeding container and should reach within 4 inches of the breeding container top. The water dispenser trough is filled with quilt batting or plastic scouring pad to soak up the water, making it accessible to the crickets without drowning them. The cricket food is placed on top of the egg “flats” in a plastic tub similar to yogurt containers. Another similar plastic tub should that contains the egg laying medium should also be placed on top. Crickets thrive in 80 to 90 degrees Fahrenheit temperatures, higher than average house temperatures, therefore a heating pad can be laid on the lid of the breeding container. Commercial cricket food may be costly at feed shops and not always available, according to the anapsid.org website. A cheaper recipe for cricket food is based on dry cat food. Take one part quality calcium, same as you would give an amphibian or reptile, with 10 parts powdered skim milk. Coat the cat food well with this mixture and feed it to the crickets. Supplement with raw vegetable scraps and alfalfa pellets to balance out the cricket’s diet. With sufficient temperatures, water and food, crickets will profusely breed.